Two members of the University of New Brunswick’s Fredericton campus community and the UNB International Student Association were honoured by the city of Fredericton at the 2016 Unsung Heroes Awards. Gail Storr, professor in the faculty of nursing, was recognized for her hard work in the promotion, support and protection of breastfeeding rights and her advocacy for healthcare in New Brunswick. In 1991, she opened the first breastfeeding clinic in the province and saw firsthand the challenges hospital practices created for women and babies. Dr. Storr chaired the committee that helped the department of health implement the Baby Friendly Initiative (BFI), a globally recognized evidence-based program to help hospitals and community health centres implement practices to enhance women’s success with breastfeeding. While she was dean of nursing, Dr. Storr led in the development of the Fredericton Downtown Community Health Centre (CHC), which works with vulnerable populations. The issue of sustainability was a concern, as the clinic did not have a consistent flow of funding; the CHC was operational from 2002 to 2011. She took it upon herself to assemble an advisory group and work to develop a partnership with Horizon Health to ensure secure funding. The province of New Brunswick’s department of health recently announced a new permanent location for the CHC at 339 King St. The UNB Student Union (UNBSU) nominated the other Unsung Hero Award recipients from UNB. One of the many functions of UNBSU is to help showcase work that UNB students are doing in the community. According to Travis Daley, UNBSU Vice President External, an unsung hero is someone who demonstrates a never-ending commitment and enthusiasm to their community. It was clear that the UNB International Student Association fit this definition, the group works hard to welcome international students to campus and the city. The final successful candidate, biology student in the faculty of science, Jillian Lamb, was recognized for her commitment to volunteering despite her busy schedule juggling school and being a varsity athlete on the cross country team. This past academic year, she was a hall proctor in Joy Kidd where she will return as an educational proctor in the fall. Ms. Lamb assisted the student union in encouraging students living on campus to vote in the federal election last October. They knocked on residence doors to inform students how they could vote for their home riding or the Fredericton riding as well as the importance of voting at a young age. Currently, Ms. Lamb is creating a program called SMILE that will kick off in the fall. The program will partner with the YMCA, who will pair a university student with a child who has a disability to help them improve motor and sensory development skills through physical activity. 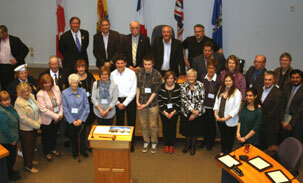 Award recipients were honoured by the city of Fredericton on April 15 at City Hall.